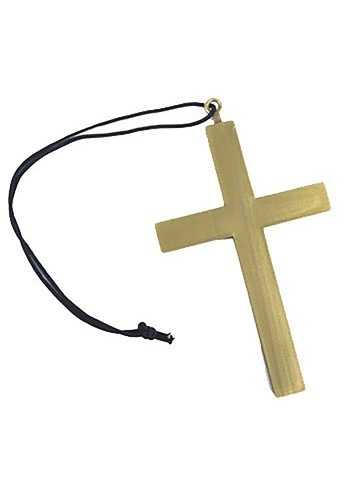 Be a symbol of peace, hope, and love with this saintly Monk Cross. People will flock to you for guidance. Angels will sing your praise. Yes! All of heaven and earth will smile because you chose to wear this cross! Now, it's up to you if you want to commit to that unforgettable bowl cut style but we'd love to see you ask your barber to shave the top of your head. So, if you end up making the leap, please send us a video. All you need now are some dignified monk robes. Maybe you're protecting Robin Hood and his merry men. Maybe you're brewing some of the best beer in all of Europe. What else did monks do? Hmm, didn't they invent the pretzel? Where would tailgating be these days if it wasn't for monasteries? We have a lot to thank the monks for. So, don this necklace and stretch that blessing hand. You're going to love that monk lifestyle.